#DebatSinar was a debate on ‘Whether street demonstrations strengthen or weaken democracy’ between @SaifuddinAbd (UMNO) and Salahuddin Ayub (PAS). It was organised by @SinarOnline and started at 9.00 PM. Hashtags used were #DebatSinar and #DebatDemo. #DebatKini was a debate on ‘Is Malaysian democracy moving forward?’ between @SivarasaRasiah (PKR), @MParitBuntar (PAS), @MPKotaBelud (UMNO) and @GanPingSieu (MCA). It was organised by @Malaysiakini and started at 7.30 PM. Hashtags used were #Debatkini. Statistics shown are from 7pm – 1am, 19th June 2012. A total of 96 users wrote 368 tweets about #DebatKini. #DebatKini was less mentioned partly due to the lack of promotion on Twitter and lack of live twitter coverage by the organiser. A total of 431 users wrote 1347 tweets about #DebatSinar. #DebatSinar benefited from live tv coverage, live twitter coverage by the organiser and heavier promotion on Twitter. Politicians were not mentioned much during the #Debatkini debate. 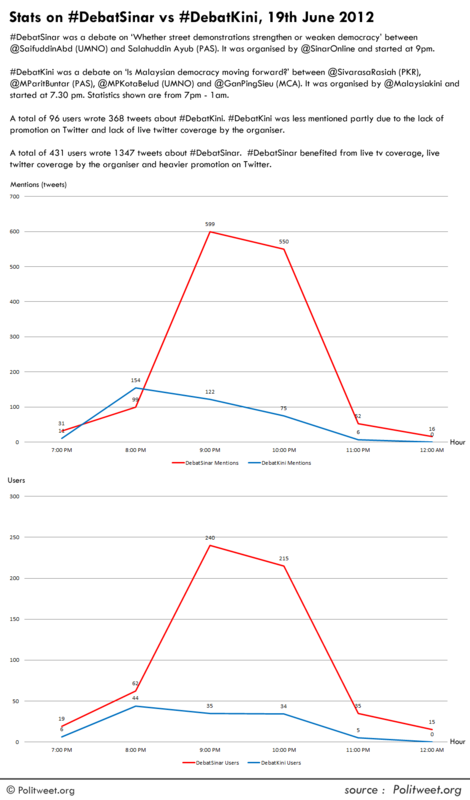 The BN politicians received 204 mentions while the PR politicians received 93 mentions. None of the hashtags used (#DebatSinar, #DebatDemo, #Debatkini) trended in Malaysia. These graphs chart the monthly number of tweets and users tweeting using a Blackberry, iPhone, iPad and Android device from April 2010 – May 2012. This is based on mentions of Malaysian politicians on Twitter, and does not include tweets on socio-economic and political topics (e.g. Bersih). Because of that these statistics are reflective of the Malaysian population. 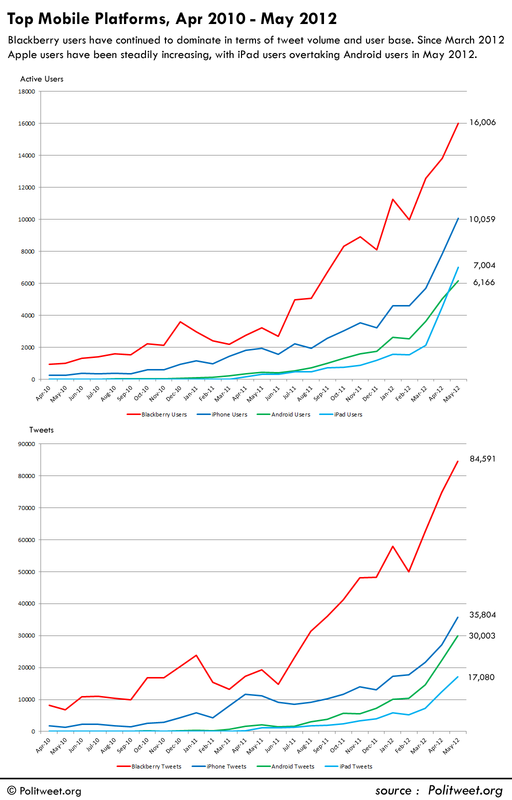 Blackberry users have continued to dominate in terms of tweet volume and user base. Since March 2012 Apple users have been steadily increasing, with iPad users overtaking Android users in May 2012.